Amazing and vibrant translucent orange to red-orange colored Natural Orange Kyanite Crystals. 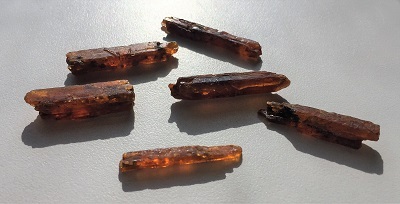 Orange Kyanite is found in Nani, Loliando, Arusha Region, Tanzania. The orange color of the Kyanite reportedly comes from trace amounts of manganese that has been deposited into the molecular lattice of the Kyanite crystal’s structure. Golden scales of mica may also be found on Orange Kyanite. 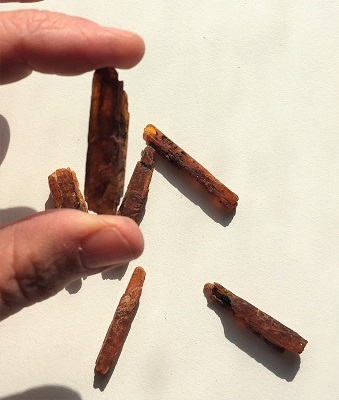 Orange Kyanite releases creative blockages and amplifies manifesting abilities. Orange Kyanite energizes the sacral chakra allowing one to operate from a higher level of creativity with passion and a sense of confidence. Orange Kyanite does not hold negativity and never requires cleaning, excellent for attunement and meditation. 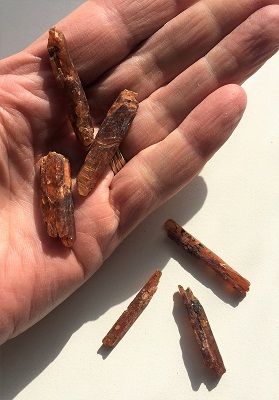 In healing, Orange Kyanite may be helpful when dealing with PMS, muscle cramps, impotence, infertility, allergies, diabetes, liver, intestinal dysfunction, irritable bowl, chronic back pain and urinary infections.